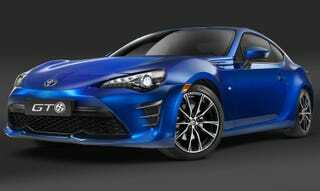 2017 Toyota GT86 (not FRS), Now With More Powahhh! Not only did Toyota listen to us (and their finance department) and gave the US the GT86 nameplate, we also got more power! This bruiser now makes 205hp! Don’t bother learning the face, you’ll only be seeing the rear end, yo! The smartest thing about this 86 is the absence of 86 badges. I can guarantee that this vehicle will have more badge thefts than the G-wagon’s headlamps or the Accord Coupe’s wheels. There are so many FRS on the roads, all of them customized, and those badges are free to take and easy to sell on Ebay.